These are the photographs that were hand selected by me for print on various formats - from canvas to metal. 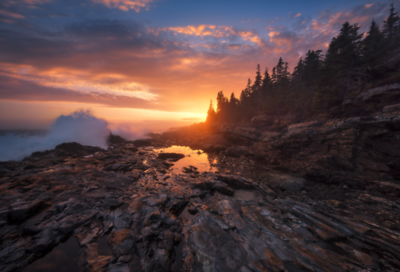 Cape Elizabeth, Maine. Cold, January morning at the Portland Head Lighthouse. I guess this shot should have been called "20 Seconds”, as it's how long that light was present before the storm moved in. 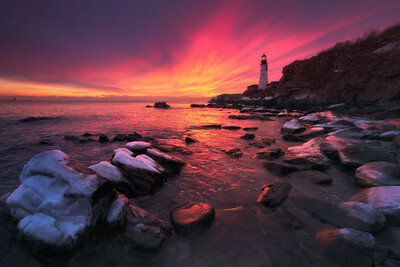 The sky exploded in bright red fireworks - reflecting on the snow and iced covered rocks, water and the lighthouse - one of the most magical sunrises at Portland’s favorite location. Bass Harbor, Acadia, Maine. 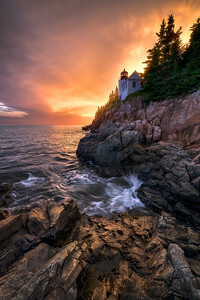 This lighthouse is probably the second most photographed on any coast in Maine (Portland Head Light being the obvious first) - Bass Harbor Head Light is located on the very tip of Mount Desert Island. I got there just before the sunset, as the thunderstorm was moving out. The light was not perfect, there were plenty of tourists and a handful of photogs, though I tried to get away from all of them by planting myself right in the middle of the slippery rocks. For just a few minutes, the sky glowed and I began shouting like a kid, (in my mind, and then later out loud to stop the surrounding chatter) “Is everyone getting this? Is everyone shooting?” I guess I was trying to tell people that this is the time, right now, for a lasting memory photograph. 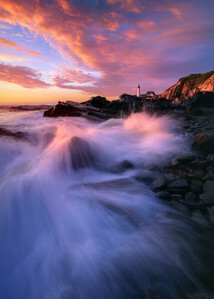 Portland Head Lighthouse, Cape Elizabeth, Maine. Sometimes you need to get wet. Sometimes, one needs to get hit in the face with a cold and heavy wave to really wake up, start all of your engines with a shot of adrenaline, make you feel alive and forget the battle you just fought and lost. 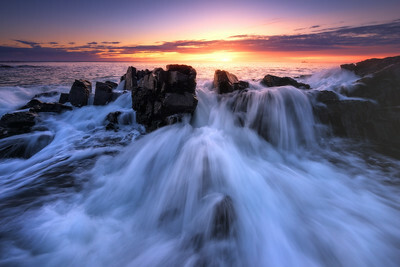 I love getting in the cold and unforgiving water of Maine coast - at times risking ruining my gear and camera (and I lost a few). Antelope Canyon at night, Full Moon, Arizona. 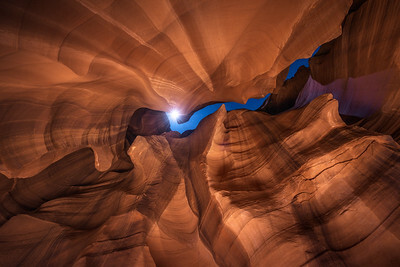 I never thought of photographing Antelope Canyon at night. It was suggested to me the very last minute by our Indian guide, while navigating locations in the desert. I could not have been happier that I decided to shoot this staple with a night sky, light painted walls, and in almost, absolute freezing weather. A full moon washed out most of the stars in the sky and in this shot it was somewhat obstructed by the rock, so it created this beautiful “Moonstar”. Spring Point Ledge Lighthouse, South Portland, Maine. -10 DEGREES outside. Wind chill temperature, probably -20. I thought I was dressed for this... yet after a few minutes I could not feel my face, so moving around on an extremely slippery, iced up rocks was not easy. My viewfinder was fogging up because of my breath through the face gaiter and I was cursing like a sailor. 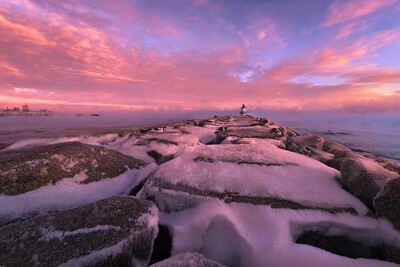 It was one of those rare mornings when a ghostly sea smoke was rising from the ocean and together with pink clouds they created a beautiful scene anywhere ones eye wandered. 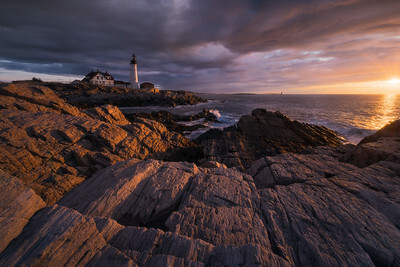 Sunrise at the Portland Headlight, Cape Elizabeth, Maine. Sometimes the unexpected happens. Completely cloudy and stormy morning gets painted in golden rays of sun. The light is so beautiful and intense that you just want to stand there, soak in the moment and say, “This is what life is all about”. Ram Island Head Light, Casco Bay, Maine. This lighthouse is located on the North side of the harbor and can be seen from areas around Portland Head Light, a much more famous lighthouse in Maine. It was constructed in 1905 and unlike the PHL lighthouse, it does not receive a lot of attention, it’s not as picturesque or taken care of. It’s actually, now a private property. A few years ago, it was auctioned off to a local doctor for almost $200,000. Yet, the light had a great a purpose back in the day. Many ships and lives were lost to the underwater rocks, when leaving or entering the bay. 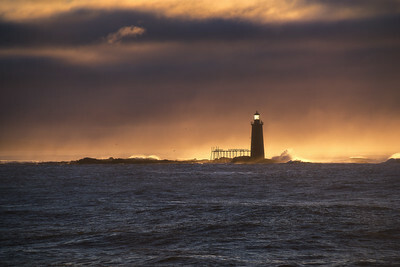 And even though its exterior is extremely battered by severe Maine weather, having no paint, and some broken down parts, it often lights up in gold, still standing strong against massive and unforgiving waves of the Atlantic Ocean. Otter Point, Acadia National Park, Maine. The night before this shot, I missed the biggest sunset of our trip. You know, the one when the sky explodes in all sorts of red, pink and magenta. The one that takes your breath away and sometimes even makes you forget to click your camera's shutter. The reason that I missed it, is I dropped my camera in the lake and most of the functions stopped working, so it spent a day or more in a bag full of rice, drying out. So naturally I did not expect the next day sunset to be this good! This is Otter Point - not the usual, more crowded sunset watching area, but a little more to the North. I loved all sorts of lines, shapes and amazing colorful rock formations here. I could spend hours exploring. Waves were high and loud, while the sunlight was naturally glowing from the moisture in the air. Acadia was at its best: beautiful, charming and full of adventure. 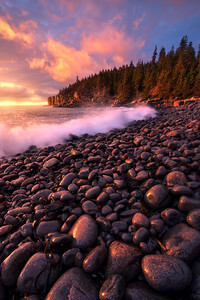 Boulder Beach, Acadia National Park, Maine. This place is amazingly beautiful. It lies right by one of the most recognizable cliffs along the Loop Road - Otter Cliffs, and always a favorite to photograph in any season. This October morning sunrise was pure magic - pink and slightly purple, early morning sky, was all of the sudden, bathing in warm and glowing light. Massive granite cliffs were turning orange, while large boulders on the beach started to sparkle to the loud sound of crushing waves - I kept pressing a shutter without taking my eyes off the glorious scene in front of me. Marginal Way, Ogunquit, Maine. Beautiful summer morning. I kept falling into the water trying to compose shots and having only sneakers on - can't really say I was prepared for the shoot like this. As the tide was receding towards the sun, more and more rocks became exposed so, naturally I went in deeper and deeper into the water. In the end, I loved the water movement of the waves; soft, glowing light, and trance music in my iPod that accompanied this shoot. 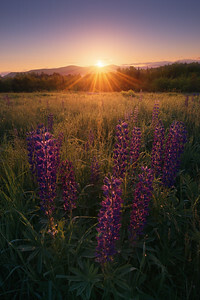 Twin Mountain, New Hampshire. The years I spent in New England are the snowiest years of my life. It is one of my favorite times of the year to photograph. I love the cold and the sky clarity it creates. The dramatic light of the East Coast sunrise before the winter storm or a sunset like this one, which will light up every single snowflake like a magical, dreamlike, almost painted, scene. At the time I did not realize, but I was standing (and perhaps also laying) on the top of the thin ice that was covering the brook, somewhere in New Hampshire, where I pulled off the side of the road. The light was too enchanting for me to pay attention to the reality of my surroundings and I felt fortunate to have left this place, dry with all my gear intact. 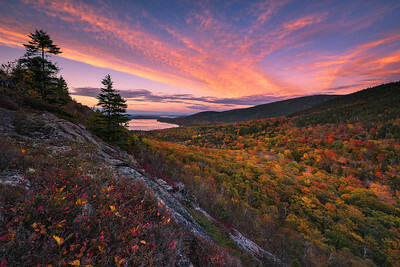 South Bubble, Acadia National Park, Maine. Foliage has been spectacular this year! Bright colored, lots of reds mixed in with yellows, oranges and greens. I literally ran up this trail chasing the fast changing light. The sun was somewhat obstructed by the clouds to the west, so it never "lit up" the fall colors - YET this is quintessential Acadia. Eagle Lake in the distance. 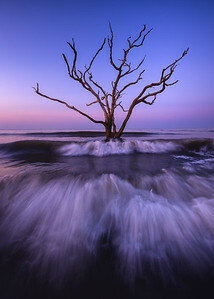 Boneyard Beach, South Carolina. This amazing place at Botany Bay is definitely a must visit, while in Charleston. A short hike and you end up in the most surreal place I have ever been to: slowly dying tees battered by countless Atlantic storms and tides that year after year, take a bit of the land away from the island forest. I did not get any crazy weather to speak of while shooting, but the time I spent before the sun came up was definitely one of my all time favorites - here standing knee or even waist high in the water trying to capture the oncoming waves. 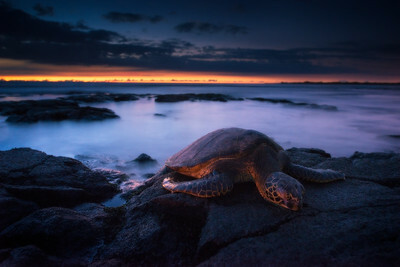 Turtle at sunrise on Big Island of Hawaii This little guy was just resting through the entire sunset and opened his eyes for just a second to make sure I have the "right" photo equipment - Nikon (he he) to have his picture taken. Boulder Beach, Acadia National Park, Maine. 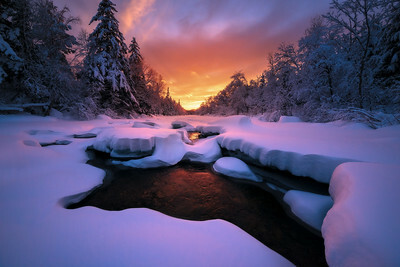 This place is amazingly beautiful. It lies right by one of the most recognizable cliffs along the Loop Road - Otter Cliffs, and always a favorite to photograph in any season. This October morning sunrise was pure magic - pink and slightly purple, early morning sky, was all of the sudden, bathing in warm and glowing light. Massive granite cliffs were turning orange, while large boulders on the beach started to sparkle to the loud sound of crushing waves - I kept pressing a shutter without taking my eyes off the glorious scene in front of me.